Automatic for the People Turns 25, And You Can Still Visit Weaver D’s in Athens, GA – Why Am I Not There? The iconic REM album, Automatic for the People, was released 25 years ago this year (Oct. 8th). It features some of their best songs — “Man on the Moon,” “The Sidewinder Sleeps Tonite” and “Nightswimming.” I’m leaving out ‘Everybody Hurts” because it’s almost comically corny now. If you find yourself in the band’s hometown of Athens, GA, you can visit the soul food restaurant that inspired the album’s title. 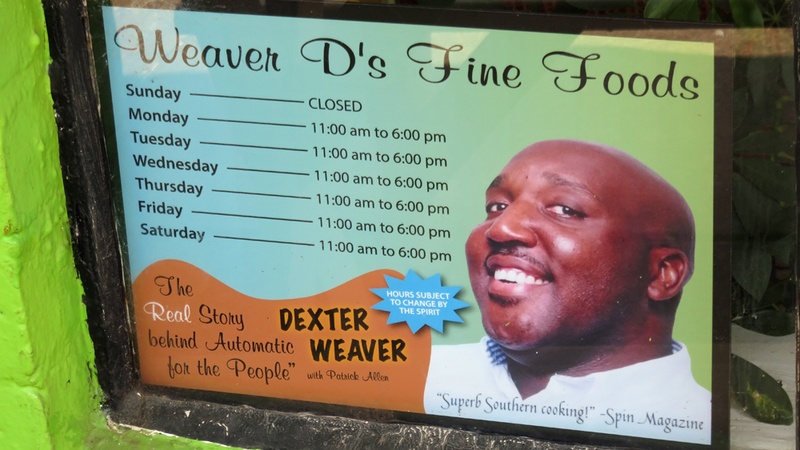 Weaver D’s Delicious Fine Foods on 1016 E Broad S is not too far out of the way for you just to drive by or get out and take a picture. It’s actually across the street from one of those upscale multi-use apartment complexes with random businesses on the ground floor. At one point it was going to close, but local outcry and support made sure it stayed open and operating. When I paid a visit, I just poked my head inside to see what was up. You can get fried chicken and gravy, pork chops, collared greens, mac n’ cheese, fried fish and sweet potato pie to name a few items from the menu.